WestWaters Hotel & Entertainment Complex can cater for a number of different style events. Our team have a wealth of experience and are here to assist you to make your event one to remember. What’s included in the function room set-up? How many guests can fit at each table? Comfortably, we can seat up to 10 guests per table. How many hours is my function duration? For cocktail and sit down events our beverage package caters for up to 5 hours. Should your event be in the evening last drinks are called at 11:45pm with the event to conclude at midnight. Duration for corporate style meetings are dependent on the type of meeting/presentation. Do you allow 18th & 21st Birthday party functions? We do allow these types of celebrations with specific terms & conditions in place. This includes organising the event with a parent or legal guardian. Please contact our Sales Executive who would be happy to discuss the details further. Yes. Upon request our team of experienced Chefs can cater for a wide range of dietary requirements. Do you allow external catering? /Can we bring any additional cakes? WestWaters Hotel & Entertainment Complex is a fully licensed venue and we provide all food & beverage for our events. Do we have the chance to sample the menu prior to the day? Our Function Co-Ordinators will be happy to arrange a time with you, once your menu has been chosen. This will be dependent on the style of events we have prior to your event and additional charges may apply. The room hire fee is incorporated in your price per person. As the event organiser, you are more than welcome to organise your own entertainment. We ask that we are kept up to date in regards to arrangements i.e. : bump in, bump out times, power requirements. Please note that the hirer must adhere to policies and no smoke machines are permitted. We can assist with sourcing entertainment for your event. This will be at an additional cost and full pre-payment will be required. Can we organise and arrange our own decorations or can you arrange the decorations for us? As the event organiser, you are more than welcome to organise your own decorations. We ask that we are kept up to date in regards to arrangements i.e. : bump in, bump out times, power requirements. Please note that the hirer must adhere to policies. Our experienced staff can provide consultation regarding any additional decorations, special table setting balloons or flowers that you may require for your function. We can arrange these ourselves, or put you in touch with local suppliers if you wish to make arrangements yourself. All such arrangements must be approved and supervised by our staff and can only be set up immediately before and dismantled immediately after your function. When should I set my RSVP date on my invites for? You should set your RSVP date for 3 weeks prior to you functions date, to allow time to chase up any late replies. Is there a discount for accommodation? We would be happy to discuss a preferred rate for yourself or your guests to stay at our accommodation Mercure Melbourne Caroline Springs. Yes. There are two levels of onsite parking available to you and your guests. 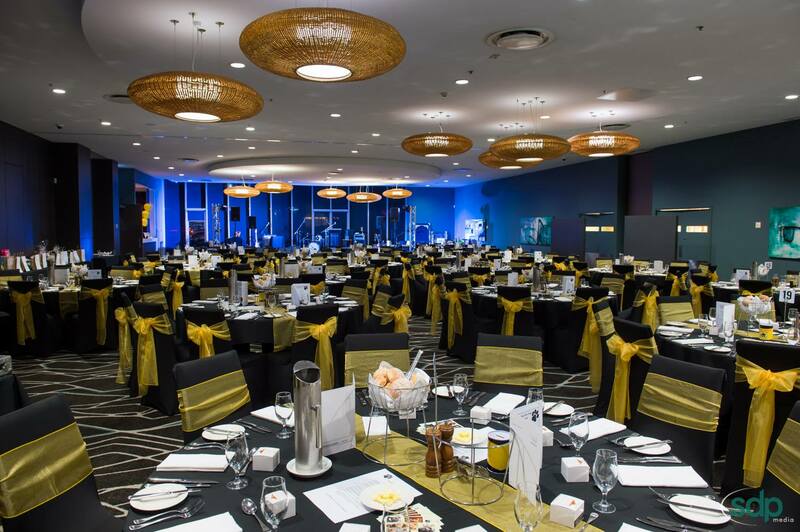 After I have received my Function Enquiry Quote, what is the next step if I want to book my function at WestWaters Hotel & Entertainment Complex? Please contact our Sales Executive to discuss your package choices. The Sales Executive will then put a formal proposal together for you and email it to you along with a 40% deposit invoice. To confirm your booking a 40% deposit of the total amount in this proposal is required within 14 days of making your enquiry. Please note payments made via Credit card will incur a transaction fee. Full pre-payment (less any payments received) is required 21 days prior to your event. When are my final menu selection and final guest numbers due? Your final menu selection (including any dietary requirements) and final guest numbers will be required 14 days prior to your Conference / Event Date.